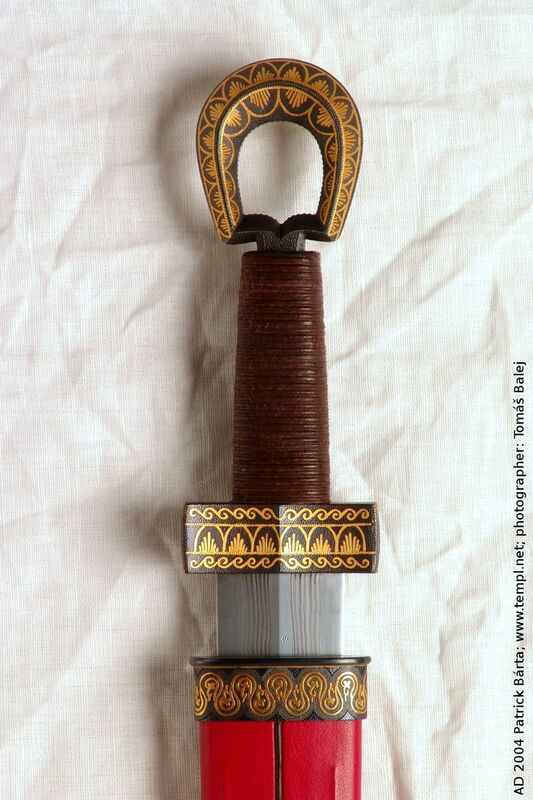 I came across a picture of a type X blade with an 'Irish' open ring hilt and it was absolutely beautiful. Have any of you seen Type X swords with open ring hilts? It seems doubtful that it would be historically accurate as most open ring pommels are more 13 to 1500s. It was still very nice to see. If you guys have any, I'd like to see some pictures. Hi Neal. All except two of the ring pommelled swords we have today have type XIX blades. One (in a private collection) is a two hander with a long unfullered lenticular blade. The other (Belfast Museum) is a type XVIII. All of these are dated to the early 16th century. The only evidence we have for dating this pommel type is artwork, which is all early 16th century, but it could be earlier for all we know. You may have seen an attempt to reproduce this type of sword, if the one you saw was a modern reproduction. Jason I believe you're mistaken. The Irish two hander with a ring pommel is currently kept in the National Museum in Dublin. My subject was worded oddly. I meant to say that I saw a reproduction type X with a ring hilt. I proposed they were likely historically inaccurate and meant if anyone has any reproduction or custom type X swords with ring hilts. I actually am commissioning a sword that is based on a type X. The long single fuller with a wide blade, that tapers into a sharp point. I'm having a ring hilt put on it because that type of sword profile is built for cutting and the ring pommel puts more focus on the blade for cutting. But regardless all your comments were educating and I really enjoy anything about Irish history. I'm currently in the midst of a Y-DNA test to learn more about the Colleran surname. My family is from Charlestown, County Mayo. This article will probably interest you then - if you have interest in Y-DNA research. Irish people are now with current scientific knowledge most likely Indo-European immigrants that ousted the original Neolithic inhabitants starting from 4000 years ago (2000 BC). So they brought in genes of red hair, blue eyes, ability to drink milk and speaking a indo-european dialect (Proto-Celtic) that ended up turning into the Celtic languages and also the genetic C282Y mutations causing haemochromatosis - a typical Irish genetic disease. known Mendelian disease variant in prehistory. These findings together suggest the establishment of central attributes of the Irish genome 4,000 y ago." Quoted from the PNAS article source given above. If you are R1b - Yamnaya Culture ancestry from todays Ukraine! [92% of Welsh men, 85% of Irish men]. So also like modern Scandinavians speaking Germanic languages we both predominately come from North of the Black Sea (Ukraine) and the steppe-nomad Yamnaya culture and migrated west driving away theNeolithic farmers originally migrating into Europe from Anatolia (and displacing or mixing with European mesolithic people). So the myth about Tuatha Dé Danaan (Tribe of Danu) being the last invasion of Ireland fits. Danaan likely a genetive case of "Danu". The Scythians (Indo-european Iranian speakers) lived between two rivers North of the Black Sea. They were called. *Danu apara = The river to the rear [modern Russian Dneiper]. *Danu nazdya = The river to the front [modern Russian Dniester]. Danu simply means "river", so the Irish are the "tribe of the river goddess". Danu becomes Don in Russian [another famous Russian River]. Actually it happens in Welsh as well as their goddess is called Dôn. The Danube/Donau another one with the Danu name. In modern Ossetic [an Iranian Language] the name for water is Don. You have Greek Daneans mentioned in Homer and a Germanic people called Danes, also both Indo-European speakers. In Indian [The Rigveda written in Indo-European Sanskrit] you have the Asura goddess Dānu (rain/liquid) the mother of the serpent Vrtra which is killed by the Deva God Indra to release the waters!! Thor and Indra is very much alike except in name and Vrtra and the Midgard-serpent (who lives in the ocean circling around Midgard) shows a shared dragon-killer mythology from a people in Ukraine [Yamnaya Culture] that as nomads wandered in opposite directions for finding pastures for their cattle. The Sarmatians shared an almost spiritual connection with their weapons, and so the life of Batraz revolves around his magic sword. While a young man, Batraz pulls his sword from the roots of a tree. This could be connected to the fact that Sarmatians were buried with their swords embedded in the earth or stone at the heads of their graves. Also the sword of Batraz plays an important part of his death, when he is fatally wounded by his archenemy, Sainag-Alder. Legend has it that Batraz tells his friend to throw his sword into the ocean. The warrior is reluctant at first, not only because of the quality of the sword but because of the spiritual connection it had with Batraz. But in the end the warrior did throw the sword and it was caught by a water goddess." Funny that is very much like the Arthur legend, isn't it [and the Ossetic story is definitely not a "Celtic loan"]. So many groups of indo-european speakers named themselves after the "People of the Goddess of the waters/river" and probably had heroes receiving magical swords. Greek superlative: aristos means "the best". Aristocracy = litt. "The best power/rule". Sanskrit ārya = One that does noble deeds, a noble one. Iran means so "(Land) of the noble ones/the best"! It's safe to say that indo-europeans didn't have any confidence problems! Niels, thank you for the information. It makes more sense to me that the Irish would have more in common with indo Europeans than Spaniards. I myself have blonde hair and blue eyes. Every man in my paternal line (even my great great grandfather born in 1862 in Mayo) have piercing deep set blue eyes, and it's eerie how similar each male in the direct line looks alike. Since my family is from Mayo, I'm expecting to have the M-222 because it's western Ireland which most the ancient blood exists. The tuatha de danaan landed in Connaught the province which mayo exists in. I've been learning Gaelic and my last name was Mac Almurhain meaning son of the stranger from beyond the sea/pirate. Sounds like Mac Olleran, which sounds like MacColleran, the descendent of this line took the name O'Colleran, when it should have been O'Olleran. But from what I gather the Collerans come from the Conmaicne Cuile Toladh. Forgive me because my keyboard lacks the characters I need to properly write the words in Gaelic spelling. I don't think M-222 could be called "ancient". It's actually more interesting in being a local Northern variant within Ireland! If it was ancient you would rather see a dominant even distribution through most of Ireland. Apparently in no area - whether Ireland or Scotland - does it comprise more than 20%. A founder group would likely become very dominant Y-DNA wise (unless the men are wiped out by hostile invaders), so the reason could be one of the following three scenarios. 1) So if 20% as max. it probably shows a perhaps later incoming group joining up with settled Indo-Europeans in Ireland. Most often "later" incoming group means conquerers, whom rather than killing the male inhabitants, becomes the new upper class and leaders (the best, the nobles ?). Off course over 4000 years many Indo-European descended groups must have tried and some succeeded in settling in Ireland and that different Indo-European groups would have different genetic sub-markers [not only Vikings or English]. When M-222 arrived in Ireland and from where is impossible to tell (yet), but it probably did spread from Ireland to Scotland with the Ulster Scots invasion into Caledonia/Alba changing the name to Scotland. 2) It's also possibly that the mutation occurred with one man in Northern Ireland and then spread from him, so it wasn't part of the original Indo-European settlers Y-DNA makeup. This is the basis of the "fertile King hypothesis" - Niall Noígíallach. 3) With 5 kingdoms having different dynasties, then "fertile" kings and nobles from different male lines around Ireland could create over time different Y-DNA distribution from Kingdom to Kingdom within Ireland! You name Mac Almurhain and its meaning does point to option 1) right - but it certainly points to not being local in Connacht (or somewhere else in Ireland). If having viking-DNA ends up to be the case, then it's very likely you would be "Gall-Gaedhil" - an independent group of people descended from mostly Scandinavian fathers and Celtic-speaking mothers having Irish names. Don't worry they were pretty badass as well! It was a band of people entirely created of mixed origins - probably tired of being called names by both groups? They were also called "Austmenn" (Eastmen) by the Vikings to separate them from "Vestmenn" (Vestmen = Gaels). Even though eventually someone could have settled in Connacht. It all depends how far a family can be traced back locally.